I started thinking about the amount of time I was spending on dealing with files, their types and their availability online. I was being sent Microsoft Word Docs, converting them to Pages, exporting a PDFs and uploading them to websites and the school Learning Management System (LMS). Problem 1: Managing the availability of your documents and worksheets online can be time consuming and difficult when allowing for iPad access. Problem 2: Teachers emailing files to each other for checking and updating and then collating the result is also time consuming. Problem 3: Re-printing or uploading revisions to worksheets and docs and deleting old copies is annoying too. Solution? 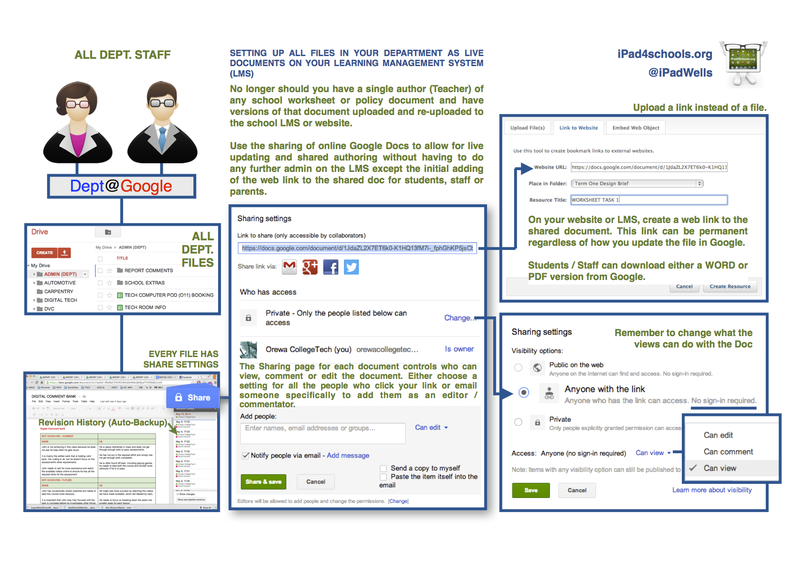 Using a central department or school Google account, I can operate and organise permanent, online dynamic Docs as the standard for the school / department files. From my Google ‘Drive’, Students can download PDF versions for working on in any of the iPad PDF apps. Multiple Teachers can access and update the single copy of any file knowing the existing links to these will access the latest version. No more work is required in updating and uploading new files as the links point to the same live document in Google Drive. My staff have seen many benefits in the first month and started working much more collaboratively. Here’s a diagram to explain the features and setup.